We have recently reversed the Dementia and Alzheimer’s symptoms in several patients with our comprehensive Brain and Body Wellness Program*. The hallmark of Dementia and Alzheimer’s disease is memory loss, confusion, depression and diminished mental cognition. The Alzheimer’s brain essentially suffers from diminished electrical activity. Unfortunately, most of our Alzheimer’s patients are not willing to go public with their testimony. Doug and Dottie have chosen to share their Alzheimer’s journey and to discuss Doug’s complete recovery at Sponaugle Wellness Institute. 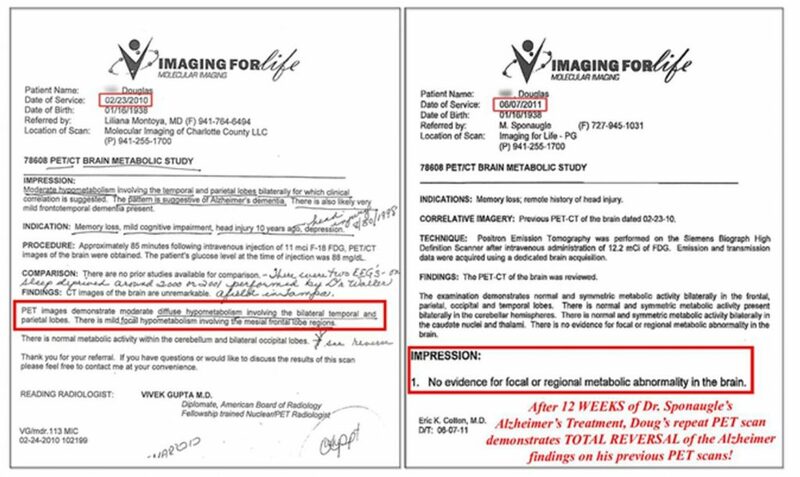 Below are the Radiologists reports on Doug’s before and after PET scans. Doug had his first PET scan one year before he came to Sponaugle Wellness Institute in February 2011. PET scans measure the glucose metabolism of brain regions, hypometabolism is the medical term used to describe diminished brain activity on PET scans. Our Alzheimer’s treatment produced a complete reversal of Doug’s Alzheimer’s symptoms and of the hypometabolism seen on his first PET scan. “Two neurologists, a PET scan and an extensive Neuropsychological examination all diagnosed my husband with moderate Alzheimer’s Disease. Doug had gotten to the point where his cognition and memory were seriously impaired, he was so depressed he wouldn’t get out of bed until noon. He no longer wanted to socialize, he suffered with mini seizures, he was shuffling his feet when he walked and his driving abilities had declined so much that he was no longer safe. He was sleeping 16-18 hours a day because he was so depressed. For the past several years, all his doctors, doctors in New York and in Florida, had referred to him as having a “flat affect.” One of our eye doctors, Dr. Dupree, mentioned the work that Dr. Sponaugle was doing to correct problems with people’s brains,” Dottie said. Alzheimer’s research at Sponaugle Wellness Institute has proven that the Alzheimer’s brain suffers from deficiencies of multiple neurotransmitters, hormones and nutrients. In addition, Alzheimer brains suffer from years of collecting environmental toxins, neurotoxins that cause inflammation of the brain’s white matter and thus slow the brain’s electrical current. Furthermore, fatty toxin infiltration causes direct destruction of the brain’s fatty tissue. Alzheimer’s patients typically have more years of exposure to toxic chemicals in our environment; pesticides, industrial chemicals like Benzene, food toxins, environmental toxins and mold toxins from water damaged buildings. Older patients tend to suffer from more immune suppression and therefore they often harbor undiagnosed brain infections, stealth infections like Lyme disease and Bartonellosis. These infections increase brain inflammation which subsequently increases TAU body formation. Short term memory is usually the first to become problematic because the first brain regions to suffer diminished activity in Alzheimer’s disease are the lateral prefrontal cortex that functions as our four-second working memory and the four-day memory which is located in our temporal lobes. Neurotransmitters, called brain chemicals, are chemical messengers that travel from one brain neuron to another. Excitatory neurotransmitters are responsible for stimulating increased electrical energy in brain neurons. Memory recall, cognition and mental performance are dependent on the electrical activity of the specific brain regions. Our Alzheimer’s research has proven that focusing only on the neurotransmitter Acetylcholine as the only important memory “brain chemical” leads to failed treatment and that enhancing acetylcholine levels with medication like Aricept is far from sufficient to reverse Alzheimer’s symptoms. Dopamine is actually the brain’s primary “cognition” neurotransmitter and the brain’s four-second “working” memory resides in the brain region most sensitive to the rise and fall of dopamine activity. Our clinical research reveals that the average Alzheimer’s patient suffers from over 20 hormonal deficiencies, many of which decrease brain function and prevent repair of brain tissue. Furthermore, neurotransmitter receptivity, the ability of a neurotransmitter to activate its brain receptor, is dependent on optimal levels of specific hormones. Receptivity being dependent on specific hormones makes correcting hormonal deficiencies a vital component of Alzheimer’s treatment. Industrial and environmental fatty toxins are registered by our immune system as foreign invaders; they have no business “hanging out in the brain.” When our immune system attacks “foreign” fatty molecules that deposit in brain tissue, surrounding brain tissue gets caught in the crossfire. The attack on bio-toxins stimulates excessive production of inflammatory chemicals called cytokines, thus increased inflammation throughout the brain. Extensive collateral damage occurs in the brain when the immune system attacks foreign neurotoxins. Brain tissue suffers from the toxin induced inflammation. The brain’s smallest blood vessels, the capillaries, become inflamed, subsequently, the 8 micron diameter capillary lumen “shrinks“ making it more difficult for the 7 micron diameter red blood cells to squeeze through, this reduces cerebral blood flow. When in excess, these clotting factors “plug” the tiny 8 micron lumen of the capillaries or “mini-pipes.” The micro-circulation in the brain is greatly diminished because the 7 micron diameter red blood cells have difficulty traveling through the brain’s smallest capillaries. This further exacerbates neurotoxin build up because of decreased “wash out” of toxins, thus inducing more brain damage in addition to causing micro-hypoxia or lack of oxygen delivery to brain cells. These fibrin clotting factors also become entangled in brain tissue producing the classic Alzheimer’s TAU bodies.